[Author’s note: I first started researching Frank “Kinney” Holbrook’s story way back in 2006, when I started the Wikipedia article about him. I published my first biography of Kinney Holbrook on this website in 2013. I made a couple substantial revisions after being contacted by two individuals providing additional background information on Holbrook: Verl Lekwa and Richard Carlson. The second edition came out in 2016, and the third and current version below was written in 2017. I want to take a moment today to revisit the memorable story of Frank “Kinney” Holbrook, the first black athlete to compete for the University of Iowa. 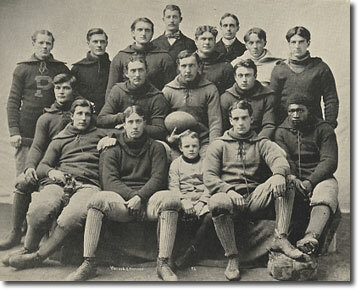 Over 120 years ago, Holbrook guided the Hawkeye football team to a season for the ages. Yet in a disappointing oversight, the University of Iowa has still failed to enshrine Kinney Holbrook – the school’s first African-American athlete – in the university’s athletics Hall of Fame. It is my sincere hope that the following article helps set in motion a movement to get Holbrook the recognition he so richly deserves. Kinney was more than just a nickname for Frank “Kinney” Holbrook – it was actually the name of his father. Frank Holbrook was born around 1877 as the son of Kinney and Pinkey Holbrook of Tipton. Before we get into the life story of the son, it’s important to get acquainted with the original Kinney Holbrook…and as it turns out, he was an incredible man. 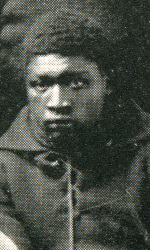 Born a slave in Georgia in 1851, Kinney Holbrook was bought and sold on several occasions as a youth. “Four times he was placed on the block and sold like an animal,” the Tipton Advertiser reported. “At the last sale which he clearly remembered, he was bought for $1,100 and taken to Virginia.” Holbrook was 11 years old at the time. While in Virginia, the Civil War overwhelmed the state. Kinney escaped at the first opportunity and sought refuge with the Union army. He became the body servant of a Union army captain, Captain Dillon, who hailed from Iowa City. When the war ended, Holbrook had served Dillon so faithfully and so well that the captain asked Holbrook to accompany him back to Iowa City. In 1872, Kinney Holbrook moved about 30 miles northeast to the town of Tipton, Iowa, where he made his home and found work cleaning houses and doing odd jobs. Considering the chances and opportunities which came to him, his life was a success…Born in slavery, with a black skin, lacking the education of schools, Kinney was seriously handicapped in the race of life. But he and the faithful and industrious wife worked hard, paid their way, and accumulated a little property, including the modest home where he died. And after a life of forty years in this community he passed away, owning the respect of all and the enmity of none. Kinney Holbrook was universally trusted and respected. Honest, faithful, and industrious, he quietly went his way, looked after the interests of his family, and harmed no one. His genial disposition made him many friends, and his answer to their greeting – “How are you, Kinney?” – which was invariably, “Quite well, thank you, sah! How is you’self?”, will be remembered by all who knew him. That was the first Kinney Holbrook. When Kinney Holbrook is mentioned today, more than likely it is his son, Frank “Kinney” Holbrook, who is being discussed. Frank Holbrook made famous the name of his lesser-known but honorable father, who set an example for Frank early in his life. Keeping out of other folks’ business is precisely how he was able to fly under the radar and become a star African-American athlete in an era of extreme racial prejudice and segregation. Holbrook first gained athletic acclaim at Tipton High School, where he was a standout in football and track. In his senior year at Tipton in 1895, he led the school to just the third ever Iowa High School State Track Meet. Holbrook helped guide Tipton High to a second-place finish at the state meet, winning the individual state championship in the 50-yard dash and the shot put events. He was also an excellent student, earning above average grades and particularly excelling in math. Frank Holbrook became the first black graduate of Tipton High School and that fall, he enrolled in a few science courses at the nearby University of Iowa. He was steered to Iowa City by several Hawkeye supporters in Tipton, who provided a fund for his tuition and living expenses. Kinney Holbrook joined the Hawkeye football team in 1895, becoming the first African-American athlete in the history of the University of Iowa and the first documented black college athlete in the history of the state. 1895 was a chaotic year for Hawkeye football – the entire football program teetered on the verge of bankruptcy, and the cancellation of the 1895 season was only staved off by a round of emergency fundraising. Because the program was low on funds, they saved money by not hiring a full-time coach, which led to a very disorganized atmosphere around the team that season. For his part, Frank Holbrook earned a football letter in 1895 by starting at the left end position. He had a few bright moments, scoring the Hawkeyes’ first touchdown of the year in a 28-0 victory over Parsons College on “a beautiful run”. But that win was followed by four shutout losses, as the coachless Hawkeyes limped to a 2-5 record. Included in that losing streak was a road loss at Missouri, and Holbrook was caught up in the first publicized racial incident of his college career during his trip. It began when the Hawkeye team boarded a train for Missouri, and the train employees – including the conductor – refused to acknowledge Holbrook’s very presence. The team train stopped at Cameron Junction in Cameron, Missouri, and the team went to a nearby hotel dining room for dinner. As the Iowa team filed into the dining room, Holbrook was stopped by the landlord and informed that “n—-rs could not eat in that dining room.” Members of the Hawkeye squad told the landlord, “If this colored boy cannot eat with us, we will find a place where he can.” The landlord held firm, and the team left the hotel. The train had to be held until a place was found where Holbrook could eat with his teammates. But the Missouri game itself, surprisingly, was played without incident in 1895, likely because Iowa simply wasn’t very good. In the 34-0 loss, it was reported that Holbrook “made some good tackles but was not up to his usual form.” The scene would be much different when the two teams played a year later. Aside from that Missouri trip, Frank Holbrook’s rookie season in 1895 came and went with little fanfare. Since this was before the advent of the forward pass, Holbrook’s end position in those days largely consisted of blocking responsibilities for the backs, which wasted Holbrook’s talents to an extent. His position on the field, the lack of success of the team overall, and the underfunded and disorganized nature of the program resulted in Holbrook’s contributions to the 1895 Hawkeyes being largely overlooked. But 1896 would be a much different story. Alfred E. Bull was hired as the head coach of the Hawkeye football team in 1896. Back in those days, the Ivy League was the power conference in college football, and Bull had been named a first team All-American center for the University of Pennsylvania football team in 1895, so he came with plenty of football credibility. Because he had literally just graduated college, the Iowa job was his first real coaching stint. But he quickly put together the best football team that had ever been assembled at the University of Iowa to that point. Bull’s ability to quickly assemble the greatest Hawkeye football team in school history was largely due to his decision to move Kinney Holbrook from the left end spot to left halfback. Holbrook would immediately establish himself as a college football sensation and one of the greatest football players in Hawkeye history. Indeed, as a state champion sprinter in high school, Holbrook demonstrated the speed that would make him a fearsome football player. The 185-pound sophomore was also quite strong, participating in several field events for the Iowa track team, and that combination of speed and strength made him successful on the gridiron. As a sophomore, Kinney Holbrook developed into an all-around player, a man recognized as Iowa’s best ballcarrier as well as their best defensive man. Iowa’s third game of the season was an important conference matchup with Kansas. In 1892, Iowa, Nebraska, Missouri, and Kansas formed the Western Interstate University Football Association (WIUFA), one of the first college football conferences in America. These four schools played each other in football every year, and the winner of the round-robin series was declared the conference champion. 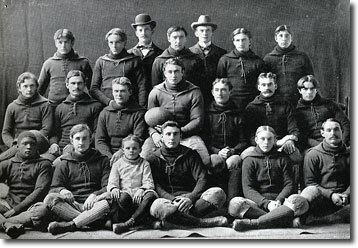 Iowa had never been much of a threat, however – the Hawkeyes had finished in the WIUFA cellar in each of the league’s first four seasons. In fact, Iowa had lost their last five conference games and had been outscored in their last four league matchups by a combined score of 128-0. But 1896 would be different. The Hawkeyes faced Kansas in the conference opener, and the teams tensely battled in a scoreless game. With eight minutes remaining in the contest, Iowa had the ball at Kansas’ 45-yard line. The Hawks decided to use a little bit of trickery to get the ball to their best player, and it paid off. Iowa lined up quickly and snapped the ball without a signal. The quick snap caught the Kansas defense off guard, and Holbrook found a seam in the defense. He took the pitch of the ball and sprinted 45 yards for the game’s only touchdown. Iowa protected that lead for the rest of the game and claimed a 6-0 victory for their first conference win in six tries. Iowa’s next conference game came against the Missouri Tigers in Columbia. That game is a whole article all its own, and I discussed that game more in depth in a Hawkeye Flashback. Long story short, Missouri objected to Holbrook’s presence on the Iowa team and insisted the Hawkeyes play without him. When the Iowa team refused, Missouri greeted the Hawkeye squad with the equivalent of a mob scene. Despite that, the Hawkeyes prevailed in a racially charged contest, 12-0…thanks in large part to a touchdown scored by Frank Holbrook. That victory guaranteed Iowa a share of the 1896 WIUFA conference championship, the first conference title in school history. Holbrook’s courage in the face of such rampant racism remains his defining moment in American sports. Two and a half weeks later, the 6-1 Hawkeyes faced Nebraska in their annual Thanksgiving Day game in Omaha. A win would give Nebraska, who was 1-1 in WIUFA play, a share of the league championship with Iowa. On the other hand, an Iowa victory would give the 2-0 Hawkeyes the WIUFA title outright. Weather conditions that day were dreadful. The field was icy, the temperatures were near zero, and snow was falling all during the game. Good play was impossible in the conditions, and the game ended in a scoreless draw. Iowa could have just left with the tie and claimed an outright title on the basis of their now 2-0-1 league record, but the Hawkeyes didn’t want to win an outright championship that way. In an unusual move, athletics officials at both schools agreed to replay the Iowa-Nebraska game two days later on Saturday. Frank Holbrook earned two letters on the Hawkeye track team in 1896 and 1897. Although he was a state champion sprinter in high school, his track success at Iowa came in the field events. In his sophomore season in 1897, he set a record at the state track meet by hurling the shot put 38 feet 10 inches. In just two short years, he had become a legitimate athletic star at the University of Iowa, and one can only imagine what he could have accomplished in his final two years at Iowa. One is left to imagine, because Kinney Holbrook left college after two years. The reasons are unknown. By all accounts, he was succeeding in his scientific courses, and he fully expected to graduate in two years’ time. Perhaps the financial burden was too great, or maybe he felt uncomfortable in the bright spotlight of his newly acquired fame. As the first famous African-American athlete ever in Iowa, Kinney Holbrook faced all kinds of pressures and prejudices that are impossible to understand. Whatever his reasons for leaving school, Holbrook’s college athletic career ended after just two seasons, leaving everyone to wonder how much more he could have accomplished in the black and gold. Frank Holbrook moved back to Tipton and found work as the town’s blacksmith. It was obvious that he hadn’t lost his love for the game of football. On November 25, 1897, he played in a hastily organized semi-pro game against a neighboring team from Wilton. Starting at fullback, Holbrook’s Tipton squad lost to Wilton, 18-10, in a drizzling rain. In 1900, Frank Holbrook married Ida Mayweather of Wilton, but the marriage lasted only four years. Holbrook moved to Council Bluffs in 1904 and was divorced that same year, a parting that was publicized in a detailed tabloid story. By 1906, Frank Holbrook had finally left Iowa and moved out to California. Holbrook found work as a blacksmith for “Lucky” Baldwin at the Santa Anita race track. Holbrook had become an expert horseshoer and found good work at the race track. A few months later, the Tipton Advertiser reported, “We are glad to say for the information of Kinney’s home friends that the matter was all cleared up eventually and he was discharged. He is now employed on the Lucky Baldwin ranch in the same position he held at the time the charges were brought against him.” That may have been misleading, as Carlson suggests that this “clearing up” was a result of taking a plea deal as an accomplice which led to his spending 100 days in jail. Frank Holbrook’s last appearance as an athlete took place in 1908. That year he fought in two professional boxing matches at McCarey’s Pavillion in Los Angeles against Jim Cameron on June 12 and July 14. Holbrook lost both fights, marking the end of his athletic career. Although he had supposedly sworn off women after his first divorce, Holbrook remarried in 1908, this time to a woman named Ella Williams. When the Santa Anita track closed down, Holbrook moved to Sierra Madre, a Los Angeles suburb, and operated his own blacksmith shop for several years. He passed the county civil service examination in 1915 and was briefly employed by the county when he fell into poor health. According to the Tipton Advertiser, Frank Holbrook passed away suddenly of a heart attack on October 29, 1916. His funeral was held at a “colored Masonic lodge” where Holbrook was a member. Frank “Kinney” Holbrook was 39 years old. When Hawkeye fans finally came around to singing Holbrook’s praises, most of us found ourselves singing the wrong tune. As time went by, people at the University of Iowa wanted to honor the achievements of Iowa’s first black player. The problem was, newspapers and other sources from Holbrook’s era often referred to players only by their last names. In an effort to fully identify Holbrook, researchers found that the only Holbrook mentioned on the alumni lists from that time period was Carleton William Holbrook. C.W. Holbrook graduated from the University of Iowa in 1897, and since Kinney Holbrook had a great football season in 1896 and then disappeared from school, researchers assumed that Kinney Holbrook and Carleton W. Holbrook were one and the same. In truth, Carleton Holbrook was actually a non-athlete from Manchester, Iowa. Frank Holbrook, on the other hand, didn’t appear on any alumni records, because he didn’t graduate. They were two separate people…but Frank “Kinney” Holbrook was erroneously called Carleton Holbrook for decades. In 1939, the University of Iowa first released a commemorative publication about Iowa football that erroneously recognized C.W. Holbrook as the star of the 1896 Hawkeyes. As a result, even wonderfully accurate resources, like the book 75 Years with the Fighting Hawkeyes, mistakenly trumpeted the achievements of C.W. Holbrook. It’s a very odd twist in a career, life, and legacy that ended abruptly and was shrouded in mystery and confusion for decades. I have spent years decrying Duke Slater’s omission from the Pro Football Hall of Fame. In much the same way, I’ve been trying for years to get the University of Iowa’s National Varsity Club Hall of Fame to recognize and induct Kinney Holbrook. Frank “Kinney” Holbrook was the first African-American athlete in the history of the University of Iowa! On top of that, he led the 1896 Hawkeyes in scoring to help guide them to the first conference championship in school history, in any sport. And if all of that weren’t enough, the way he bravely conducted himself during the 1896 Missouri game is the stuff of sports legend, the kind of truly courageous performance that should be commemorated forever by a school like Iowa. Kinney Holbrook’s impact on the University of Iowa is everlasting. Although he passed away over 100 years ago, it is time for the University of Iowa to properly celebrate the achievements of its first African-American athlete. I continue to call upon the National Varsity Club to induct Frank Holbrook as a Hall of Fame candidate from the Heritage Era and to thank him, on behalf of a grateful University, for paving the way for every African-American Hawkeye athlete to follow.